big dream for your church? You are a visionary leader and your church probably has a vision statement. 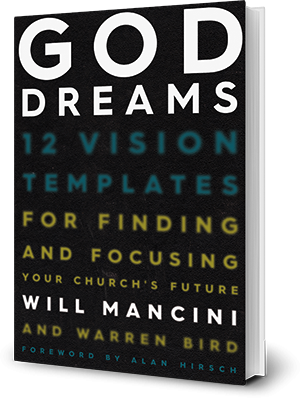 Based on more than 10,000 hours of church team facilitation, Will Mancini’s newest work reveals a simple and powerful planning method that will bring energy and focus to your church like never before. shows how to reclaim the role of long-range vision today by providing 12 vision templates with biblical, historical, and contemporary illustrations. explains how to overcome the fruitless planning efforts that many church teams experience. With a tool called the Horizon Storyline, leaders can connect short-term action steps with the long-range dream, while leveraging the power of storytelling to make the plan "stick." Ministry without clarity is insanity. God Dreams is your passport to leading a better future. Download a FREE God Dreams Visual Summary here. Please check your inbox for an email with a link to the downloads. There seems to be an issue with your submission. Please try again later.